The National Newspaper Publishers Association (NNPA) has enjoyed a long history of supporting organized labor, particularly during the Civil Rights Movement when many unions and civil rights-focused organizations worked together to secure legislation that benefitted African Americans. 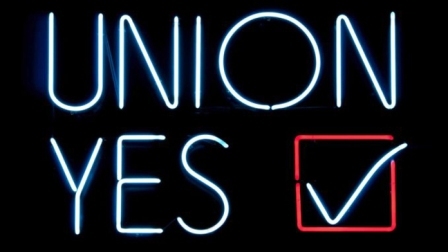 The NNPA has continued to foster relationships with trade and labor unions, including its decades-old relationship with the United Auto Workers Union. The UAW has played a historic role in pioneering civil rights and freedoms in the workplace in communities and throughout the world. “The National Newspaper Publishers Association has been and continues to be a strong supporter of organized labor in the United States and throughout the world,” said NNPA President and CEO Dr. Benjamin F. Chavis, Jr.
“The African American community especially recognizes and affirms the strategic and historic importance of the United Auto Workers because of their longstanding leadership in demanding and organizing for freedom, justice and equality,” Chavis said. “The Black Press of America stands for racial justice and empowerment, and we note with appreciation the support of the UAW in our long struggle for racial equality and justice across the nation,” he said. To that end, the NNPA has drafted a formal resolution that has been distributed to 220 Black-owned newspapers and media companies who will vote on its ratification during the 2019 Black Press Week, scheduled from March 19 to March 23 in Washington, D.C. In part, the resolution reads: “Whether it was hosting Dr. Martin Luther King Jr. as he wrote his historic ‘I Have a Dream’ speech in Solidarity House or providing bail for Dr. King’s 1963 release from Birmingham City Jail, the women and men of the UAW have and continue to play an historic role in our nation’s civil rights movement. UAW’s International Secre­tary-Treasurer Ray Curry, who’s also a member of the Daimler Supervisory Board, met with NNPA officials in Washington on Wednesday, Feb. 6th seeking to strengthen the relationship between the Black Press of America and the UAW. Dorothy R. Leavell, the national chairman of the NNPA and publisher of the Crusader Newspapers in Chicago and Gary, Indiana, said she believes the relationship between the organizations will continue to grow. “There’s always been a strong relationship between our publications and my family with unions and, as a result of the relationship as it relates to our leadership, it has been one of being supportive because of the strong representation that’s needed for our people on jobs in the workforce,” Leavell said. “We have always been very cognizant and supportive of that movement. We appreciate their [attention] to African Americans in the workplace and we want to encourage even more realizing that [the union] has new leadership and that we are indeed continuing in that long tradition that dates back years,” she said. Chavis added that, “Today we are witnessing renewed resurgence of racism and therefore the NNPA’s solidarity and ongoing working relationship with the UAW and with the AFL-CIO needs to be re-emphasized and revitalized.